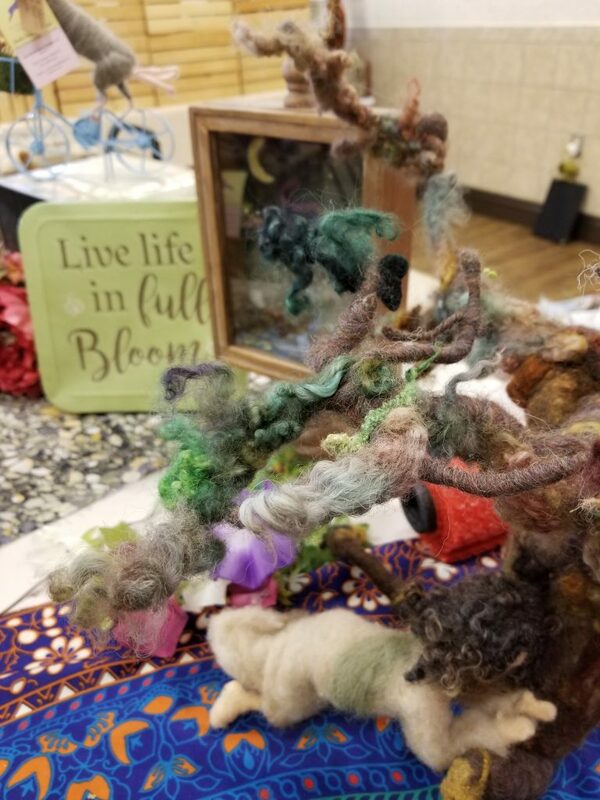 Home › haldecraft › So how was the 2019 Spring Fiber Fling? 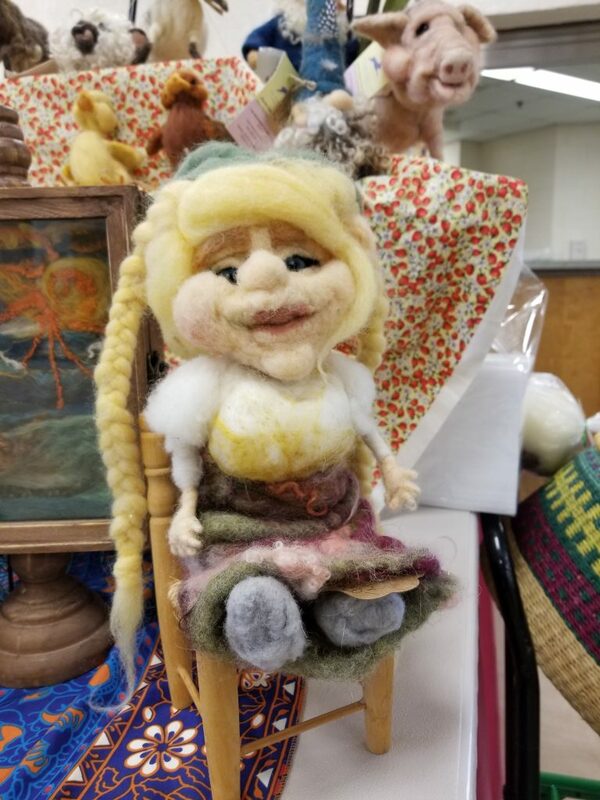 When I went to the Florida Fiber-In last year, I met Karen, who invited me to apply to be a vendor at the Spring Fiber Fling. 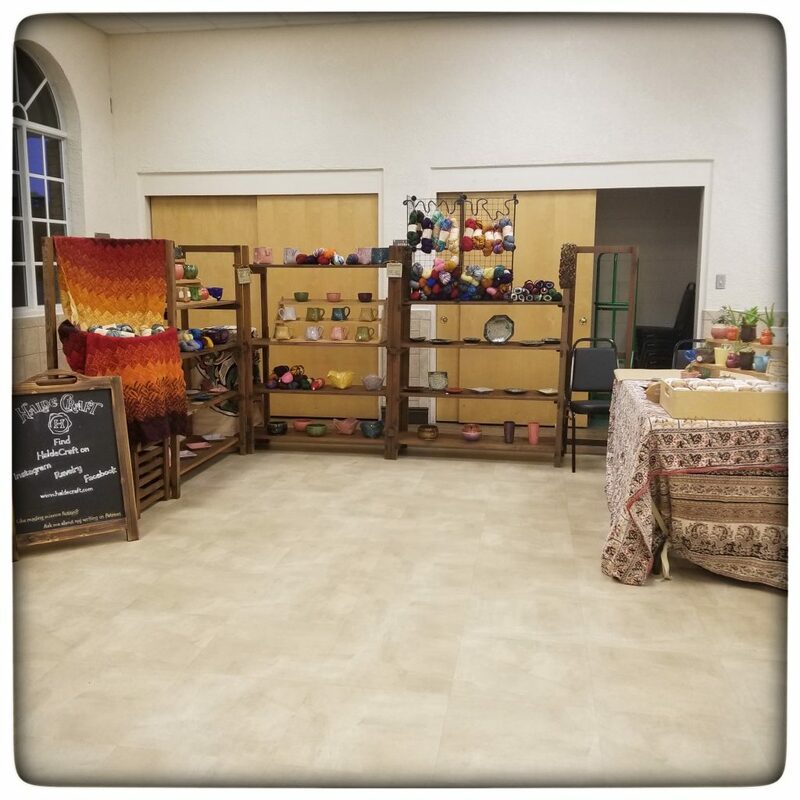 I'd never done a rug-hooking event before, but I am familiar with the crafty women who live in and around The Villages (who used to come up to Hanks when we owned the yarn store) so I thought... heck yeah! Let's do it! The event was fun - I mean, my friend Susan came and helped me and we'd have fun at a funeral; it was great to have a girl's weekend wherein we did a lot of crafting and talked with a lot of crafters and were exposed to a craft we'd never done (y'all, rug hooking is not what I thought it was - more on that in a minute). 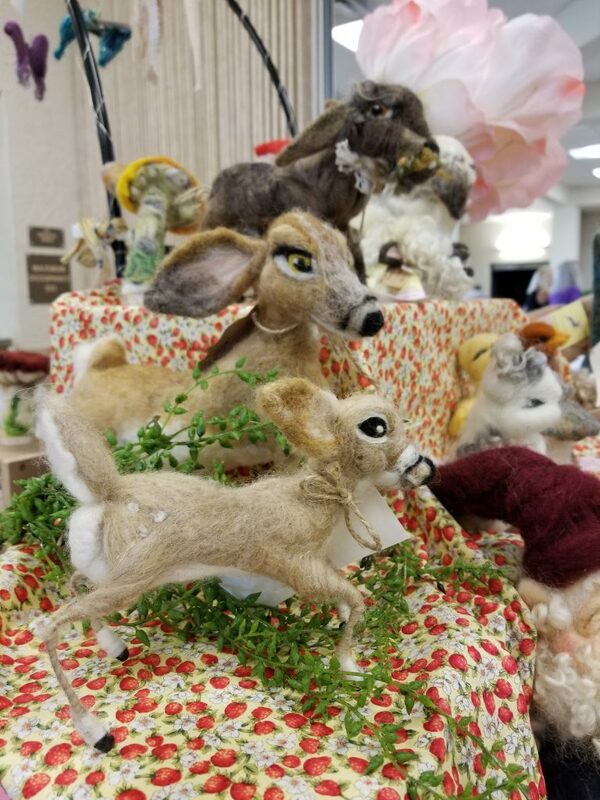 When Susan was walking around watching people get set up, she came back and told me, "there's a booth that looks like a fairy garden, you HAVE to go see it." And thus I discovered The Traded Rabbit Co. 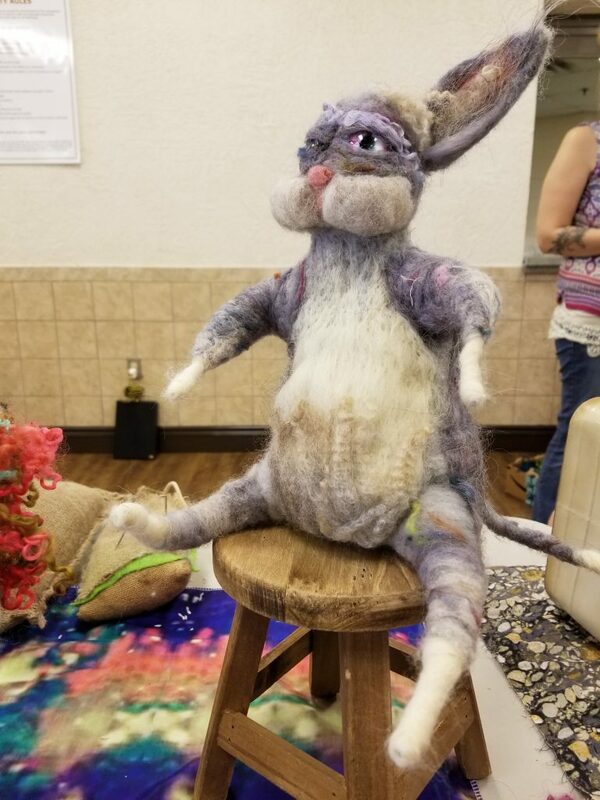 Allow me to show off a few of her amazing felted pieces.... (my deep apologies if, when I hit post, those pictures are all sideways. WordPress is giving me fits this morning). I KNOW, RIGHT?!?!?! 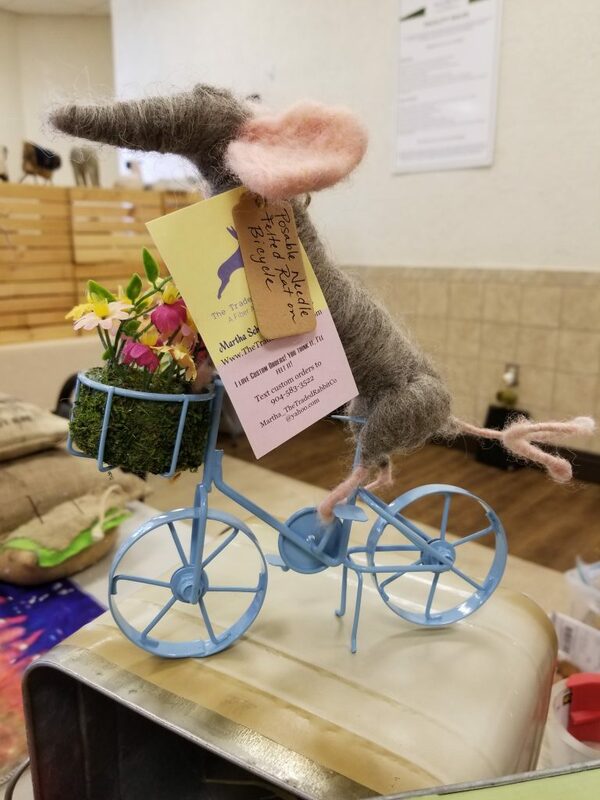 That rat on the bicycle totally came home with me. 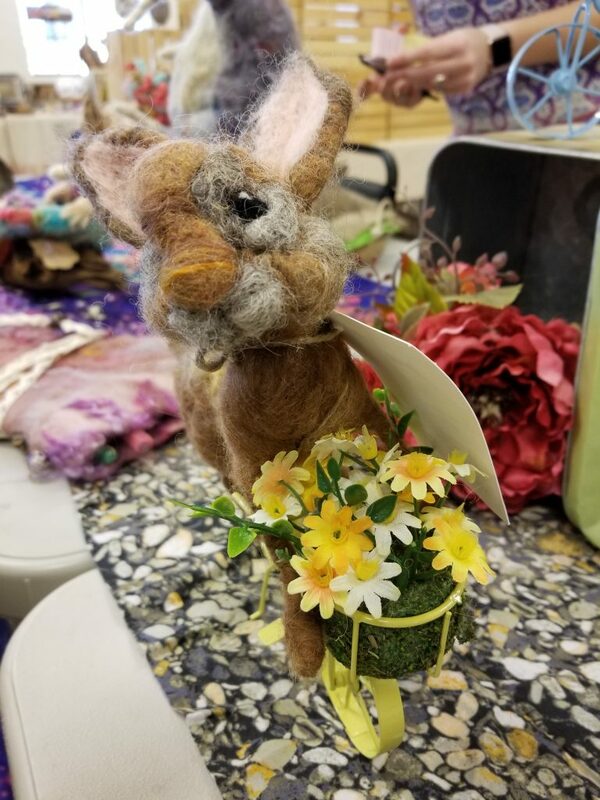 So, what is rug hooking? It is NOT those kits your grandmother used to buy, with a pre-printed, pre-colored picture on canvas, and small cut lengths of wool that you'd pull through with a hook and knot, giving you a fuzzy wooly picture about the size of a legal-sized sheet of paper. It's similar, though, in that you have a pre-printed picture on ... it looked like burlap. It's not colored in, though; the colors are in your head. And you buy these beautifully dyed yards of wool that you cut into strips the size that you need for the burlap, and and then with a hook, you pull through just a little bit of the strip of wool. You keep pulling it through in different places, not all the way through but so that it just ... nubs up, a little (this makes sense when you see it). This can be in any size from a small pillow to a throw rug. So, basically, we were surrounded by beautiful fibers and colors all weekend, and let me tell you... as someone who loves color and texture, this was not a bad way to spend time, AT ALL. Of course I was also constantly evaluating what I had brought and what I can bring next year (I totally want to do this event again). 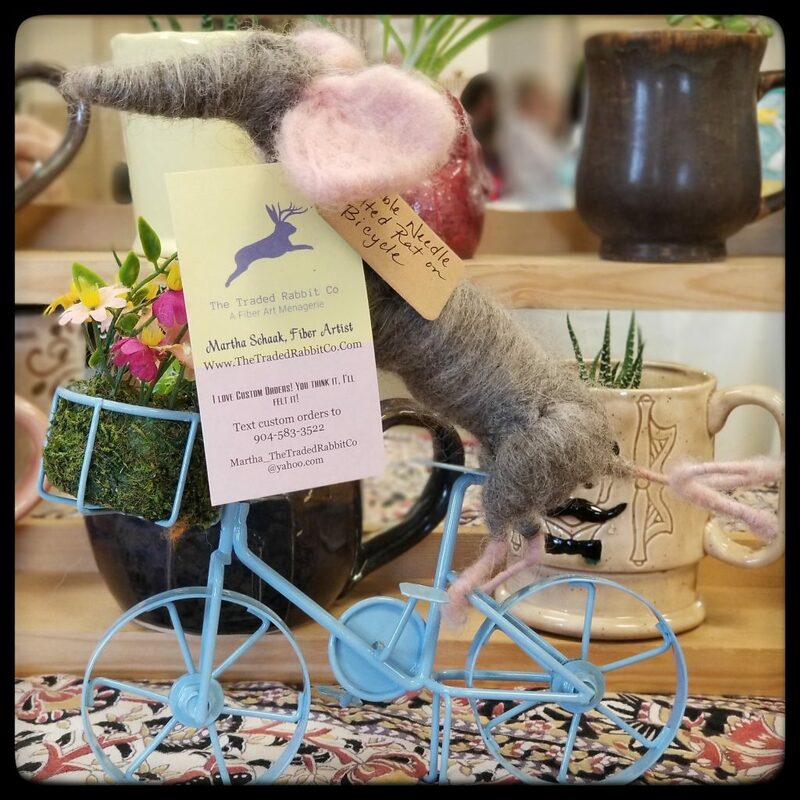 I was asked for "sheep things".... so I'll work on making some sheep mugs, and maybe some sheep soap dishes and trays - almost all the chocolate clay doily trays I brought with me, sold out. I'm also thinking of getting a luggage carrier for the roof of my car, because my new shelf setup (which I do love) is so large that there's not much room inside the car for actual product. I felt like my shelves looked a little thin, and I want to work on fixing that. Without having to buy a bigger car, haha. One last thing - Karen runs a really well-done event. There was lunch for vendors (and for participants! ), there were people walking around every few hours offering water to vendors, the door prizes were evenly spaced out giving people lots of time to enjoy and also to hope for what comes next, and there was plenty of seating for everyone - both table seating where they could craft and chat, and a big setup for demos. A lot of learning happened that day!